What Mental Game Skill Minnesota Wild Comeback? 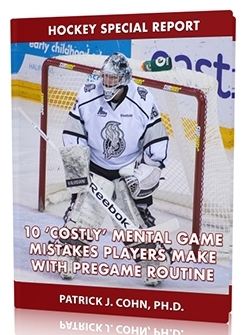 The mental game of hockey is critical when you’re down big in a game and need a miracle. The Minnesota Wild were down by 4 goals with one period left playing at home. But they mounted a massive comeback in the third period and won a shootout against the Chicago Blackhawks. Was this a focused comeback built on a shift in momentum or a case of sitting on the lead by the Blackhawks? Many teams hold themselves back with a comfort zone. A comfort zone is a mental barrier that limits what a team is capable of accomplishing. A comfort zone is most often a problem whenever a hockey team has a big lead. They become complacent or begin to protect their lead. I try to help athletes break free of comfort zones so they can peak perform more often. The Wild did not participate in the first two periods of the game, but turned it on in the third. “The first 40 minutes we watched them skate and watched them play. But the last 20 minutes was great. The crowd and the atmosphere was unbelievable,” said Wild coach Todd Richards. When a team begins to hold back and “protect” a comfortable lead, that’s when momentum can shift rapidly. ..
“When we scored a goal, it changed the momentum. Our legs came back, everything came back and things went well at the end,” said Guillaume Latendresse. And when momentum shifts to the home crowd, watch out. The fans get involved and the beaten up team comes alive. It’s like stopping the momentum of a runaway train. “We had to find a way to kill off the momentum and we didn’t do that. So they just kept going off it right into the shootout, and that’s what happens. It’s unfortunate, but we’ll learn from it,” said center Jonathan Toews of the Blackhawks. When you are down by four goals, you can gamble without the pressure of making mistakes. So there’s no pressure. You can just have fun trying to make goals. Fun and momentum sounds like a good formula for a big time comeback. “Sometimes it’s a lot easier coming off the bench. When you’re down by that much, there’s not really a lot of pressure. You just go out there and have fun,” said Josh Hardin. Your hockey psychology tip for today… When you have a comfortable lead in the game, keep an offensive mindset and go for more goals. Don’t protect your lead as no lead is safe. If you’re behind a few goals, look for signs you have momentum and have fun trying to turn around the game. You never know when your opponents will protect the lead, tighten up, and lose the momentum. That is a great tip, I think that this works better in minor hockey, but not so much in the pros. Some teams like the NJ Devils have such a great defensive game that if they get a 2 goal lead, and then switch to a defensive shut down it is hard for the other team to get a goal. I do agree though that you should always be looking for offensive chances.